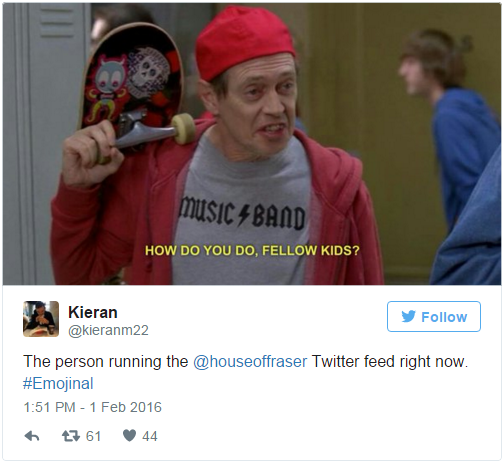 If you’ve been on Twitter as of late, you will have no doubt come across the VERY mixed response in relation to House of Fraser’s new #Emojinal (or rather ‘Over-Emojinal’) campaign. The brand began by erratically tweeting emojis and hooking on to trending Twitter topics in an ‘emojinal’ way – whether relevant to them or not. What probably started off as a brainstorming strategy to tap into a new audience of younger ‘millennials’ has ended in ridicule and shock across Twitter, with only very few commenters applauding their new approach in the run up to Valentine’s Day. To add fuel to the fire, House of Fraser then started responding to shocked customer tweets with ‘sad face’ emojis – which only angered the loyal fan base of the 167-year-old brand. Their reasoning behind it? A spokesperson for House of Fraser told City AM: ‘We wanted to try something less traditional for Valentine’s Day this year in order to engage with a younger audience,’. With this in mind, they banked on findings from recent Bangor University research that revealed 72% of the younger generation now find it easier to express their emotions with pictorial symbols rather than words. So, you could say the strategy was somewhat informed with insight – however I think the problem lies within how that insight was then conveyed in an ‘on-brand’ way. With the campaign looking set to be 2 weeks long and focusing mainly on Twitter, one could suggest that it’s likely to run out of steam considering the real-time nature of the platform. A lot of responses have suggested that ‘all publicity is good publicity’ and therefore some may deem it a runaway success. However, with an end objective of increased sales within this new market, will they really see any sort of uplift from a user that potentially can’t even afford their products? Plus, if the campaign continues, will they see their loyal buyers decrease as a result of the negative backlash and handling of community management? Criticisms aside, I am all for brands looking at new ways to reach alternative audiences, and believe House of Fraser could have sparked less backlash with a few simple strategic decisions. Having partnerships with the likes of student discount site UNiDAYS means there is already a whole pool of younger users (over half a million on Facebook) already aware of House of Fraser’s brand association with the student-focused site. A collaboration opportunity here could have eased the brand into the market, with such content and activity resonating better through partner sites, thus decreasing or even sparing the backlash from their current customer base. In many of the tweets it was fair to say it felt like a grandparent was sat behind the computer thinking of ‘funky fresh’ ways to be ‘down with the kids’. Not only was it irrelevant to their current consumers and way off their brand tone of voice, it almost made a sweeping generalisation about the interests of the 18-25 audience they were trying to reach. My thoughts? Emojis tailoring products – yes. 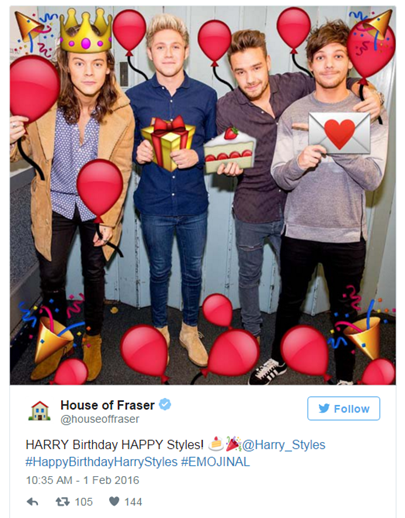 Emojis adorning Harry Styles – 100% no. The heavy social takeover of all their social platforms was always going to shock some, mainly because there was nowhere to hide from it. Therefore, a less over-bearing approach would be to direct the target audience through to a content-focused microsite, where people could play quizzes and watch videos to their emoji-heart’s content. 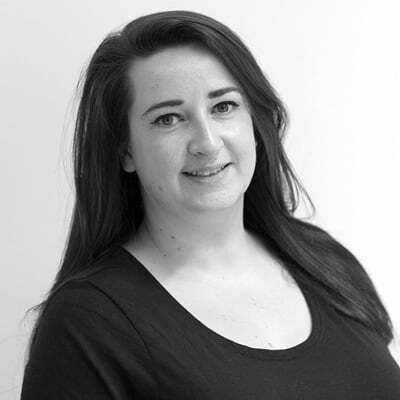 To further ensure this was reaching the right sort of user; integrating a paid social approach would enable the brand to target key new audiences based on demographics, interests and digital behaviours - therefore lowering the chances of annoying loyal customers. Plus, through paid social advertising they’d be able to actually measure the direct impact on sales as well as the basic reach uplift – a win-win for employees showcasing their results to management (which can be a hard feat for social marketers!). It will be interesting to see House of Fraser’s next move on this campaign and whether they’ll get the performance results they expected. We’ll keep our eyes on this one!